1xRUN is excited to welcome back California artist Glenn Arthur as he returns with his latest edition Always Remember. Revisiting his very first painting created a decade ago, Arthur has reworked and refined this acrylic painting to include 10 years of progression, showing his signature looks at hummingbirds, flora and skulls with attention to detail that his fans have come to expect. 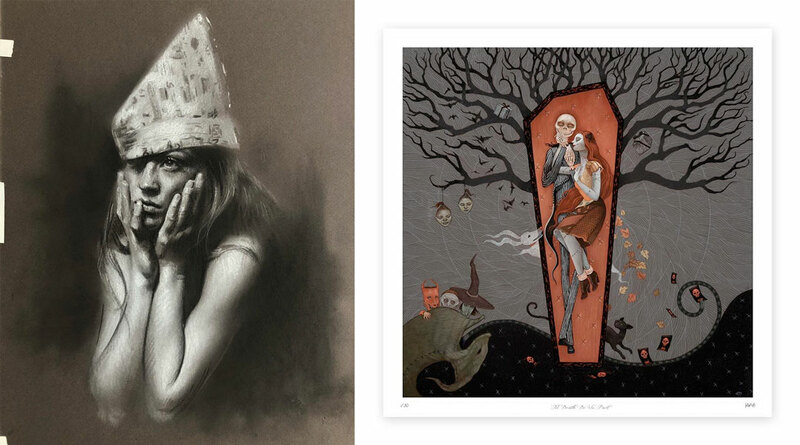 Available in Standard and Hand-Embellished editions, these prints also coincide with Glenn Arthur’s birthday! 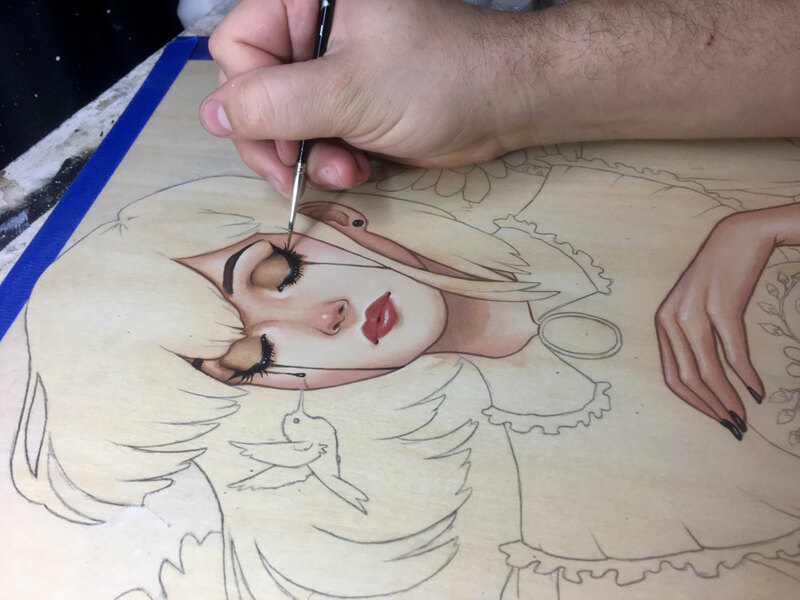 Read on as Glenn Arthur gives us the lowdown on this painting 10 years in the making, a look at his process, and much more. . .
1xRUN: Tell us a little bit about this piece, anything immediate you’d like to highlight? Glenn Arthur: This piece is an updated painting of a 10 year old concept. The original design was done in late 2008 and it was one of the first times I had ever attempted to paint. I had only ever worked in graphite and ink before that. The plants that are surrounding the girl in the painting are actually succulents called aeoniums. I have a pretty big garden full of succulents and these are some of my favorite. 1x: Was this piece part of a recent theme, series or show that you had? Arthur: It wasn’t for anything specific. 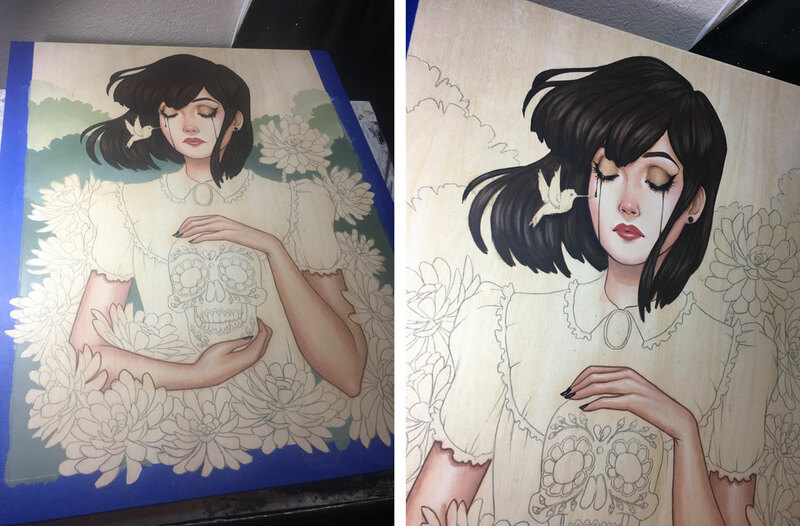 I just realized it had been 10 years since I started painting, and I thought it would be fun to show a side by side progress of my style and skill using the same concept. 1x: When was this piece created and what materials were used ? Arthur: The painting is acrylic on wood. I started working on it towards the end of 2018 and completed it at the beginning of 2019. From start to finish it took about 2 months. Arthur: The original piece from 2008 was painted around, and inspired by, the holiday Dia De Los Muertos. My family on my mother’s side are from Mexico, and I’ve always enjoyed the rich and colorful culture. 1x: What is unique about this piece? 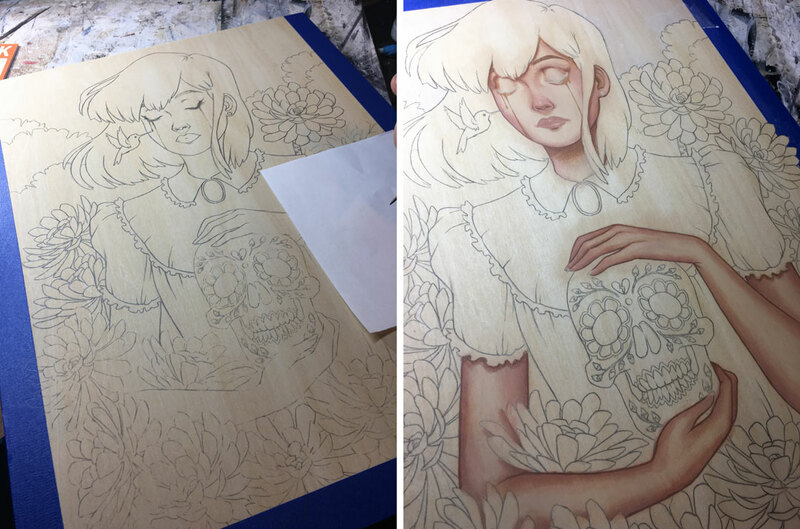 Arthur: It really shows that although my style and skill have progressed, I still pretty much continue to work in the same themes of love, death, nature, and beauty. Arthur: Because it’s cool! And I feel like it’s a 10 year milestone of my work. 1x: Describe this piece in one gut reaction word. Arthur: I think it’s been longer than two years. I’ve missed you guys! Since the last time I’ve moved from Southern California to the San Francisco Bay Area. I love it up here so much! When I’m not painting, I’m either working in my garden or wrangling my small herd of cats. 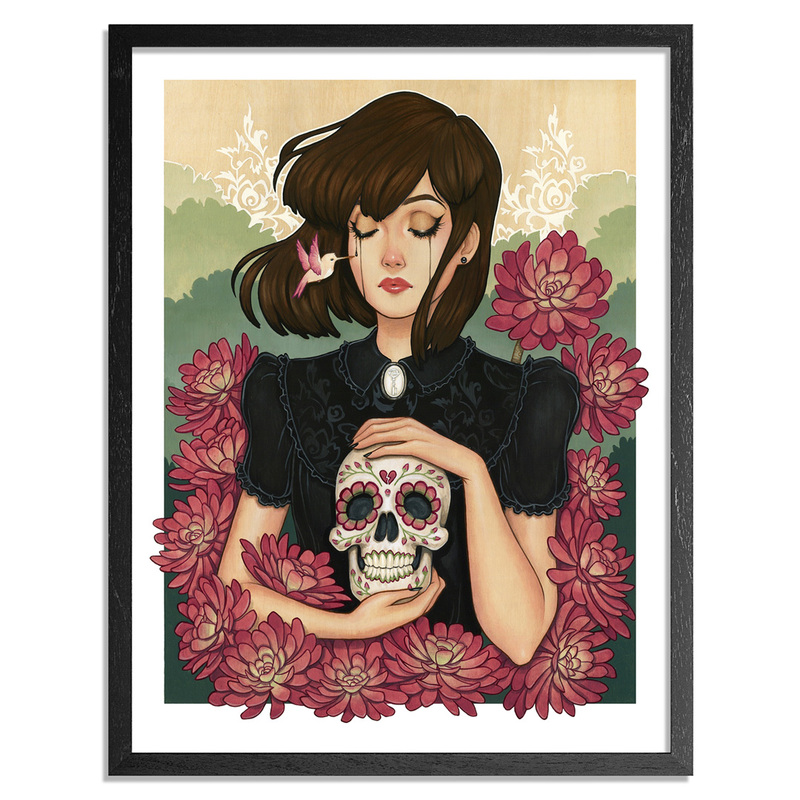 1x: We’ve seen a few recurring themes in your work including skulls, flora and hummingbirds pictured in this recent edition, where did the fascination with each come from and is it a conscious effort including them in your work? Arthur: I think it’s a matter of things that tend to defy my level of reasoning. Hummingbirds are so fast and small that they seem to almost break the laws of physics. Plants are extremely resilient and adapt to the craziest conditions to thrive and bloom. And death is the greatest mystery of all. 1x: What are some of the most challenging subjects to draw/paint for you? What are some of the more fluid ones? Arthur: The most challenging subject for me to paint is anything mechanical. Organic subjects are much more second nature and way more fluid and for me. 1x: What are some of the ways you’ve been trying to push yourself with your work as of late? Arthur: Lately I’ve really been working on painting in different mediums. I’ll always love acrylic, but I’ve recently been loving watercolor and ink. Eventually I want to try gouache and oil paints. 1x: What strides do you feel you’ve made as of late with your work? Arthur: I feel like I’ve perfected the art of painting with a cat on my lap. Haha. 1x: Any new artists that you have been turned onto lately? Arthur: Kate Zambrano, Kurtis Rykovich, Kelogsloops, Margaret Morales, and Ahmed Aldoori to name a handful. 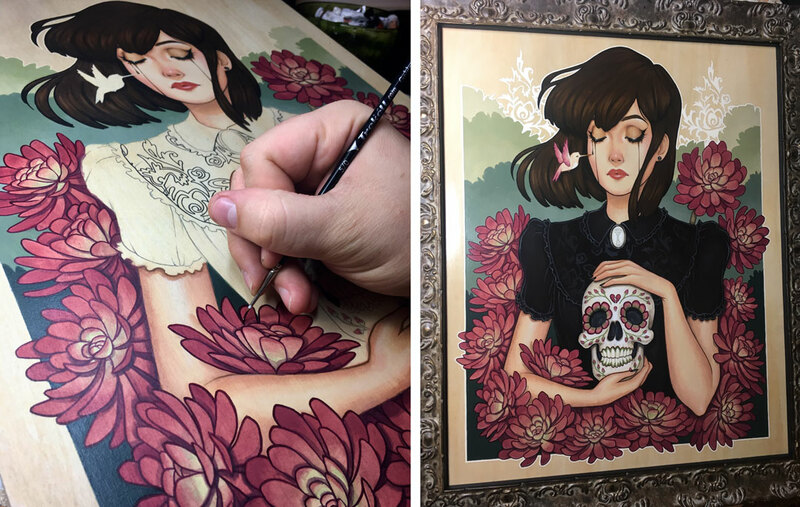 Arthur: It was a print of a beautiful Nightmare Before Christmas inspired painting called “Til Death Do Us Part” by Leilani Bustamante. 1x: What else do you have coming up in the next 2-3 months here as the year gets going? Arthur: I’m working on a new series of paintings that are inspired by my favorite desserts. I have a huge sweet tooth and I like sugar way too much so I thought it might be more beneficial for my health to paint desserts rather than eat them. Haha.